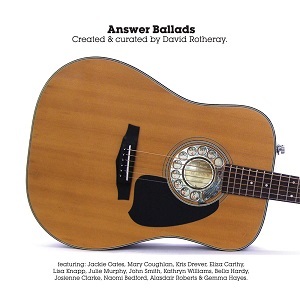 Songwriter David Rotheray has for his latest album, Answer Ballads, taken some of the best known characters from popular songs - for example, Jolene, from the Dolly Parton hit, and has then written songs from their perspective. It's an interesting idea, and the songs are really well written. The songs are all ballads though, so the album does suffer as a result - there are only so many ballads you can listen to before starting to lose interest unfortunately. The album has been recorded with a whole host of guest singers, with each song being sung by a different singer, which does help keep interest levels up and helps to give each song more of it's own identity. Sadly though while the vocals are great and the music is good, there's not much musically to link the songs to the songs they are based from, and the album just fails to keep my interest sufficiently for me to be able to recommend it.